Yet another A-Z list, but this one inspired by a comment on another that it would be interesting to see the highest ranked games on BGG for each starting letter in the alphabet. I figured this would be an interesting first list for me. So I took the top 250 games (from 24 April 2003), copied them into Excel, manipulated a bit, and voila! This list. Complete with (highly opinionated) comments. In the comments, I list the top few games at each letter, with their score (from 1-10) and their rank from 1-250. The only judgment calls I needed to make was when the top ranked games for each letter were expansions. Pretty much my decisions were arbitrary, but basically I did not accept a top ranked expansion to a game as the highest unless it a) adds significant game play changes (subjective, admittedly) and b) is alphabetized with the same starting letter as the original game (which is usually the case). Also, I lump all expansions to a game together with the game and place them at the ranking of the highest significant expansion. On to the list! Comments are strongly encouraged. And we begin with what must be considered a surprise. 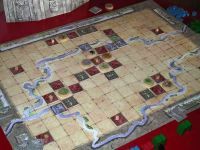 Not that I have ever played Age of Steam, but if I were to guess at the number one 'A' game, I would have guessed Acquire, based on its reputation. I have to admit, however, that while I enjoy Acquire, I don't think it is as good as my personal favorite 'A' game, Aladdin's Dragons (#231). 'A' is well represented in the top 250: 18 entries. Oh, and I HATE Advanced Civilization. No real shock here. Thirteen 'B's in the top 250, and expanded Bohnanza tops the list. I've only played Bohnanza without the Jobs and Field beans; it's ranked #85. 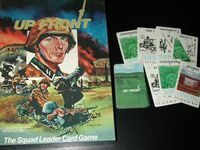 If I allowed expansions, the top 'B' would be Banzai: Up Front Expansion. But Up Front is a 'U' game. My favorite 'B' is probably Battle Line (#92). 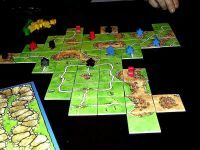 I included a top four here, since the two Carcassonne's are different, but similar. I've actually played all four of the games above, and I'd have a hard time choosing which I like best. But it's a moot point, since hands down my favorite 'C' game is Cosmic Encounter (#126). How it isn't one of the top games is a mystery to me. 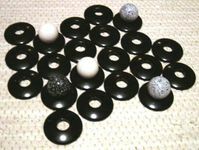 But out of the 23 'C's, it's beneath the above games as well as Crokinole and Carabande, neither of which I've played. Only 6 'D's in the top 250, but some good ones at the top. 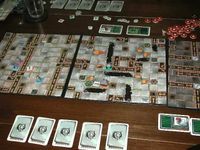 I've never played Dungeoneer (but I've seen it in the store) and I might have to look into it sometime. 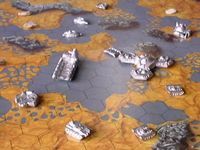 I have good memories of playing Dune when I was younger, and I player Dvonn for the first time today on BrettSpielWelt. It looks really deep. My favorite 'D', at least for now, must be Diplomacy (#152). I find it remarkable that two 'Z's actually made into the top 250. And I've even played Zertz, so I guess its my favorite 'Z' game. Knizia's masterpiece heads up a surprising long list of 'E's in the top 250: Eleven of them. I've never played the other two. An aside: 'E' is one of two letters with more than one game in the top ten. Can you guess the other? My favorite 'E' is probably Euphrat & Tigris, although I enjoy Evo (#193) a lot, especially when played with the advance rule where one less gene than players is drawn. Another brilliant 'E' is the Napoleonic masterpiece Empires in Arms. Nine 'F's in the 250, and I've never played any of the top three. Very sad. I understand one can get a King's ransom for a copy of Full Metal Planete on eBay nowadays. My favorite 'F's are Filthy Rich and Falling, neither of which make the top 250 on BGG. I played Falling at my own wedding! At the reception, of course. Only 4 'G's in the top 250. I read somewhere that if there is intelligent life anywhere else in the universe, then they play Go. There is something mathematically inevitable about this game. 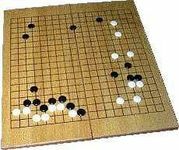 I ocassionally enjoy a game of Go, but it's too much for me. My favorite 'G'? Give me the Brain! p.s. 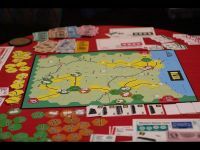 : Check out the "year" for Go in the BGG entry. Nice touch! Nine games for 'H' in the top 250, and my favorite 'H' is not among them: Hare and Tortoise. I've not played any of the top three, but I'd like to try Hammer of the Scots someday. 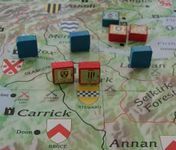 I'm an old wargamer, and it sounds right down my alley. 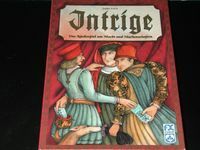 I've seen that Intrige can be played on BrettSpielWelt, and so I've have to learn it now that it's the top ranked 'I', even though its down at 109 overall. Only seven 'I's in the top 250; Illuminati is my favorite. Only two 'J's in the top 250, and I own them both! Which do I like best? hmm... I guess Java is better, even if it's bit like comparing apples and oranges. What's Keythedral like? never played it. But, my friend Matt in L.A. had the idea a long time ago of using cards to modify chess. We even played a few games with twenty or so cards he made. The inventiveness of the Knightmare Chess cards far surpass his, and it's my favorite 'K' game. Five 'K's in the top 250. 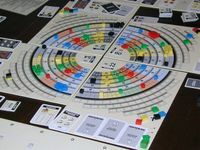 Die Macher tops a powerhouse list 19 'M's in the top 250. I've owned Die Macher for about 18-24 months now, and haven't played it yet. It's length and complexity scares many people away. My favorite 'M' is Mare Nostrum (#146), even though it seems to have some flaws. 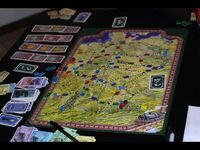 And I have to mention one that I love, but never hits the table any more: Magic Realm. 6 'N's in the top 250, and 3 with 'Napoleon' in the name. (The other is Napoleon, #163). I'm not familar with any of these. Napoleon in Europe barely qualifies for this list, with only 31 ratings. You know, I can't think of a single game I've played that begins with 'N'. Why do so few games begin with 'N'? Does the universe end with a bang or a whimper? But this list ends with a whimper. The leftovers. And finally, the two letters of the alphabet with no entries in the top 250: Q and Y. I used BGG's advanced search to find these. Quoridor comes in with a rating of 7.06, which is not too bad; the bottom game of the 250 had a rating of 7.116 (Beyond Balderdash). And I think it deserves better; Quoridor is wonderful. I'd own it if it weren't so expensive. The best 'Y' game, Yucata, is way down at 6.010. Someone get out there and design a great game beginning with 'Y'. Anyone up for a game of Yuphrat & Tigris? Only 2 'O's in the top 250, and here they are. 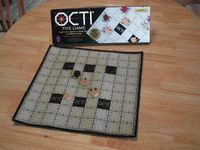 I've been intrigued with Octi for a long time, but I've never played it. It seems like it could be a real brain burner, but with the number of options available, it's probably hard to look ahead very far. Being unable to think of any other 'O' games, I guess Odin's Ravens, by default, is my favorite 'O'. But I think it is a good game, so this is not such a bad forced choice. Here it is: Mighty 'P'. Only 9 in the top 250, but three in the top ten! And I have to agree: my favorite 'P' is Puerto Rico. I've been playing it a lot on BrettSpielWelt, both with and without the expansion buildings. And it's hard to say now, but I think I like it better in the original form: it seem a bit more balanced without the expansion. Some combinations of original and expansion buildings are very powerful, and occasionally you can get combinations that enable you to play without having to worry about what other people do, which was never really possible in the unmodfied original. But I am nitpicking; Puerto Rico is brilliant! Someday I'll have to try Paths of Glory. I haven't played my copy of Roby Rally in a long time, and I don't really know why. Probably cause it takes a long time to play. It's a lot of fun. My favorite 'R' is The Republic of Rome (#151). Another good 'R', also one of the 13 'R's in the top 250, is Royal Turf (#127). I gotta try Ra on BrettSpielWelt. Dang there's a lot of 'S's in the top 250: 38 of of them! But 14 of them are Catan or Expansions or Reworkings like Settlers of Canaan. 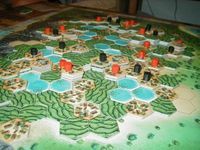 I know some of them are different games, and some of the expansions significantly change the game play (like the Cities and Knights expansion) but I wanted to include something besides Catan, Catan, Catan in the top 3. So I dropped down to Samurai. My fave? The Settlers of Catan card game. But Star Wars: The Queen's Gambit (#104) is in the mail. Hope it gets here soon! p.s. Anyone have a copy of Through the Desert they want to trade for a copy of Tikal? It's been too long since I played Up Front. My very battered copy is sitting languishing in my closet. I agree that it is probably the best 'U' game out there. There were 5 'U's in the top 250, a large number for what must be an uncommon first letter for a game. I have a question about Ursuppe. I've heard it compared to Evo. Are they very similar, or is it worth getting Ursuppe if you like Evo? These are the only two 'V's in the top 250. I don't know a thing about them. The only 'V' game I can think of that I have played is the old Victory Games wargame Vietnam. Good game, but not as good as The Civil War. 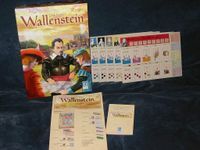 Is that dice tower in Wallenstein really necessary? Out of the 10 'W's in the top 250, the only one I have any knowledge of is Web of Power, from playing one game on BrettSpielWelt. I enjoyed it, but I'm afraid my top 'W' game must be reserved for the premier of monster wargames: World in Flames. Yeah! Give me 10,000 counters in a game any day of the week! wahoo! more charts! more rules! yaaah! Sorry about that outburst. My grognard roots are showing. I'm afraid I need some German game therapy again. Anyone for Settlers of Catan? Here it is. The 'X' game in the top 250. I've never played it. All I know, being from Steve Jackson games, is that it is certainly overpriced. Another Knizia gem, Lord of the Rings, tops a very strong group of 9 'L's. 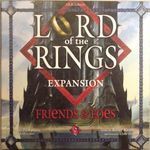 Seven of the nine are in the top 100, athough two are Lord of the Rings expansions. Lord of the Rings itself is down at #165. And although I like the Lord of the Rings boardgame very much, I'd say my favorite 'L' is The Lord of the Rings: The Confrontation, with Lost Cities (#62) a close second.